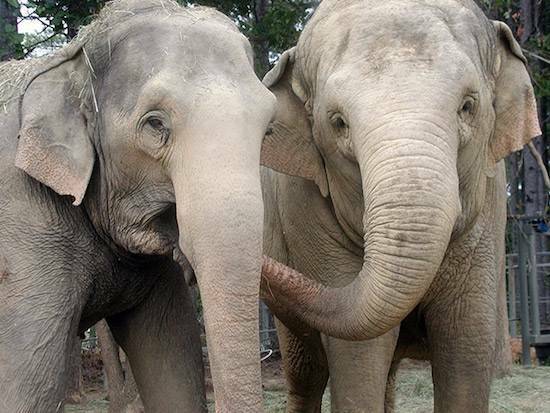 The Elephant Sanctuary announced today the passing of Asian elephant Misty, age 52. The much loved Misty arrived at The Sanctuary in 2004 after four decades of traveling and performing. 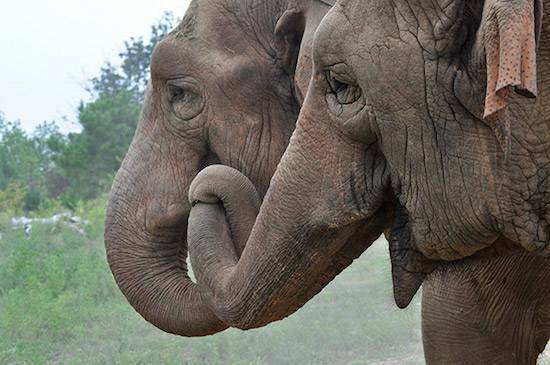 The Elephant Sanctuary announced today the passing of Asian elephant Misty, age 52. The much loved Misty arrived at The Sanctuary in 2004 after four decades of traveling and performing. Misty resided in the Asia Habitat alongside Tarra, Shirley, Sissy and Winkie. During her twelve years in residence, Misty was often seen grazing and napping under the open skies, splashing in the habitat’s ponds and lakes and spending time with Tarra and Shirley. Misty arrived at The Sanctuary suffering from chronic foot disease, arthritis, and exposure to tuberculosis – all conditions that are sadly common to elephants who have spent most of their lives in captivity. In recent months, Misty slowly showed signs of increased discomfort and a decrease in appetite. This past week the progression of chronic, incurable conditions and associated pain worsened. Misty was humanely euthanized Wednesday afternoon. She passed away peacefully, surrounded by those who cared for her. Tarra and Shirley were nearby. Misty was captured in India in 1965 when she was approximately one year old. Little is known about Misty's first decade in captivity, although records show she traveled with several different circuses. In the early 1970s, Misty was purchased by the founder of "Gentle Jungle," a company that trained and leased animals for use in television, movies, and amusement parks. Misty appeared in an episode of the sitcom "Sanford and Son" later in the decade. In 1983, Misty was performing at the now closed Lion Country Safari in Irvine, California, when she broke loose from her chains and tried to flee the park. Local news outlets reported that sections of a nearby highway were shut down and helicopters were used in an attempt to corral Misty. Tragically, a park official was fatally injured attempting to capture her. Misty was eventually subdued and returned to exhibition. In 1988, the Hawthorn Corporation purchased Misty. She spent the next sixteen years being leased out to circuses as part of the Hawthorn herd. When not performing or traveling, the elephants were chained in place inside a barn for up to 22 hours a day. As a result of USDA prosecutions against Hawthorn Corporation, Misty and barn companion, Lota, were both transferred to The Sanctuary. They arrived on November 17, 2004 becoming the fourteenth and fifteenth residents. Lota died two months later as a result of an advanced case of tuberculosis. Misty was treated for exposure to the disease, and after a year of treatment, was moved from quarantine and placed with the herd in the Asia Habitat. Misty formed close relationships with several elephants at The Sanctuary. In the Asia Habitat, Misty was reunited with Delhi, a herd-mate from the Hawthorn barn confiscated by the USDA and placed at The Sanctuary in 2003. They later formed a bond with Dulary when she retired from the Philadelphia Zoo in 2007. Misty and Dulary’s favorite activities included splashing and swimming together in the pond near the Asia Barn. Following the passing of Delhi in 2008 and Dulary in 2013, Misty began to spend more time socializing with Tarra and Shirley. 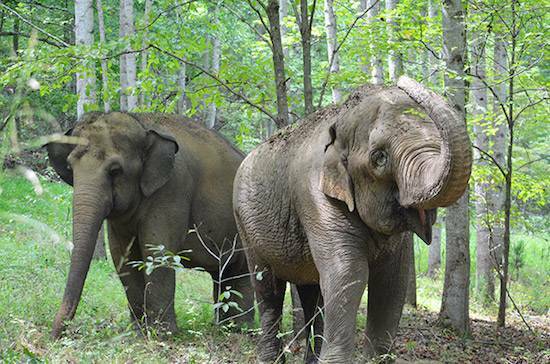 In the company of Tarra and Shirley, Misty began to venture farther away from the barn and exploring much more of the 2,000 acre Asia Habitat. “Misty had a mind of her own,” shared Lead Caregiver Nicole. “She didn’t stick to the trails like the other Asians, she found new places to nap and graze as she traveled throughout the habitat." 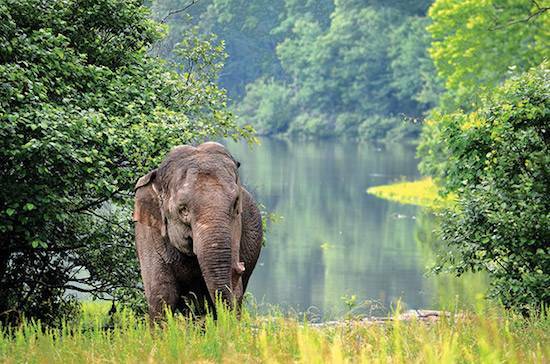 In the summer of 2014, staff noted Misty in areas of the habitat never previously visited by elephants. Caregiver Sarah added, "It always made me laugh to find her lying in the sun, still using her trunk to explore the ground around her for potential food." Staff celebrated on June 11, 2014 when they found Misty had walked over a mile to the 25-acre lake and gone for her first swim there. Misty was seen splashing, dunking, and even taking a nap on the muddy bank afterward (VIDEO). Misty's explorations continued the following spring when she returned to the lake area, frequenting areas now known as "Misty's Hideout," and "Misty's Mud-Wallow." In recent months, Misty slowly showed signs of increased discomfort and a decrease in appetite. The Sanctuary Veterinary and Husbandry staff made changes to her diet, offering increased amounts of her favorite foods, and closely monitored and treated her pain and other symptoms. Last week there was a marked change in her behavior and significant decline in her overall health. Misty quit socializing with other elephants and refused food, taking only limited amounts of liquids. She began spending more time sleeping and napping. Care staff used fluffy wood shavings to create additional bedding for her in the Asia Barn. Outside, sand piles created comfortable napping spots. Her favorite foods such as banana leaves and sugar cane were offered along with a variety of liquids. The progression of the chronic, incurable conditions and associated pain worsened. Misty was humanely euthanized on April 13, 2016. She passed away peacefully on a sunny afternoon, surrounded by those who cared for and loved her. Tarra and Shirley were given the opportunity to visit Misty’s body. Tarra walked quietly by while Shirley took time to softly touch and caress the body. Misty was buried next to her two companions, Delhi and Dulary. It is The Elephant Sanctuary's policy, to perform necropsies on all deceased elephants to gain knowledge that will benefit the entire elephant care community.